The First Quebec Conference (codenamed "QUADRANT") was a highly secret military conference held during World War II between the British, Canadian,and United States governments. The conference was held in Quebec City, August 17, 1943 – August 24, 1943. It took place at the Citadelle and at the Château Frontenac. The chief representatives were Winston Churchill and Franklin D. Roosevelt, hosted by the Canadian Prime Minister, William Lyon Mackenzie King. Although Churchill suggested that Mackenzie King be involved in all discussions, Roosevelt vetoed the idea. As a result, Mackenzie King's hospitality was almost purely for ceremonial purposes. Joseph Stalin, leader of the Soviet Union, had been invited to join the conference, but he did not attend for military reasons. The Allies agreed to begin discussions for the planning of the invasion of France, codenamed Operation Overlord, in a secret report by the Combined Chiefs of Staff. It was agreed that Overlord would commence on May 1, 1944, but this was subsequently disregarded and a later date was finalised. However, Overlord was not the only option; for example, Operation Jupiter remained a strong possibility had the Germans proved too powerful on the French coast. In the Mediterranean (a theatre on which Churchill was very keen) they resolved to concentrate more force to remove Italy from the alliance of Axis powers and to occupy it along with Corsica. Churchill and Roosevelt made it clear that they would only accept unconditional surrender from Italy, with there to be a complete and immediate cessation of fighting. News came through of the fall of Sicily to Allied forces, an invasion that had taken just 38 days. It was then decided that an invasion of Italy would begin on September 3, 1943. However, an armistice was signed that same day, which officially put Italy out of the war. There were discussions about improving the coordination of efforts by the Americans, British, and Canadians to develop an atomic bomb. 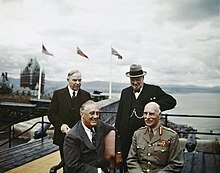 Churchill and Roosevelt, without Canadian input, signed the Quebec Agreement, stating that the nuclear technology would never be used against one another, that they would not use it against third parties without the consent of one another, but also that Tube Alloys would not be discussed with third parties. Canada, although not being represented at the particular meeting, played a key role in this agreement as she was a major source of uranium and heavy water, both essential in the atomic bomb. It was decided that operations in the Balkans should be limited to supplying guerrillas, whereas operations against Japan would be intensified in order to exhaust Japanese resources, cut their communications lines, and secure forward bases from which the Japanese mainland could be attacked. In addition to the strategic discussions, which were communicated to the Soviet Union and to Chiang Kai-shek in China, the conference also issued a joint statement on Palestine, intended to calm tensions as the British occupation was becoming increasingly untenable. The conference also condemned German atrocities in Poland. It was clear that eliminating Italy from the war was the Allies' main priority; this was expected to be done by the end of 1943. Following this, the next hope was that Germany would be defeated by the fall of 1944, which would leave just Japan remaining among the Axis powers. ^ "Quebec City: 400 Years of History". Retrieved 2013-01-23. 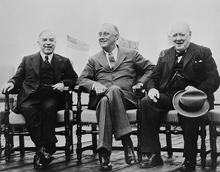 Canadian Prime Minister William Lyon Mackenzie King hosted Churchill and Roosevelt, but did not participate in the conferences. ^ English, John A. (1991). The Canadian Army and the Normandy: A Study of Failure in High Command. London: Praeger Publishers. p. 31. ISBN 978-0275930196. ^ Dewaters, Diane K. (2008). The World War II Conferences in Washington, D.C. and Quebec City: Franklin D. Roosevelt and Winston S. Churchill. Arlington, Texas: University of Texas. p. 115. ^ Reardon, Terry (2012). Winston Churchill and Mackenzie King: So Similar, So Different. Toronto: Dundurn Press. p. 254. ISBN 978-1-4597-0590-6. ^ Dewaters, Diane K. (2008). The World War II Conferences in Washington, D.C. and Quebec City: Franklin D. Roosevelt and Winston S. Churchill. Arlington, Texas: University of Texas. p. 120. ^ Dewaters, Diane K. (2008). The World War II Conferences in Washington, D.C. and Quebec City: Franklin D. Roosevelt and Winston S. Churchill. Arlington, Texas: University of Texas. p. 111. ^ Reardon, Terry (2012). Winston Churchill and Mackenzie King: So Similar, So Different. Toronto: Dundurn Press. p. 256. ISBN 978-1-4597-0590-6. ^ Morison, Samuel Eliot (2002). History of United States Naval Operations in World War II: Sicily - Salerno - Anzio: January 1943 - June 1944. Champaign, IL: University of Illinois Press. p. 239. ISBN 0-252-07039-9. ^ Reardon, Terry (2012). Winston Churchill and Mackenzie King: So Similar, So Different. Toronto: Dundurn Press. pp. 249–250. ISBN 978-1-4597-0590-6. ^ "Mr. King Leaves Today For Quebec To Meet Churchill". Ottawa Citizen. 1943-08-30. Retrieved 2013-01-23. ^ "Text of Premier Churchill's Address". Ottawa Citizen. CP. 1943-08-31. Retrieved 2013-01-23. ^ "Churchill Urges Parley of Three Allied Nations". St. Petersburg Times. UP. 1943-09-01. Retrieved 2013-01-23. ^ Reardon, Terry (2012). Winston Churchill and Mackenzie King: So Similar, So Different. Toronto: Dundurn Press. p. 254. ISBN 978-1-4597-5090-6. Ehrman, John (1956). Grand Strategy Volume V, August 1943-September 1944. London: HMSO (British official history). p. 15f. Wikimedia Commons has media related to Quebec Conference, 1943. The first Quebec Conference and related conversations at Hyde Park and Washington, WISC . Churchill at the first Quebec Conference, 1943, The Churchill Centre, archived from the original (archival news footage) on 2009-06-29 . This page was last edited on 26 February 2019, at 22:46 (UTC).